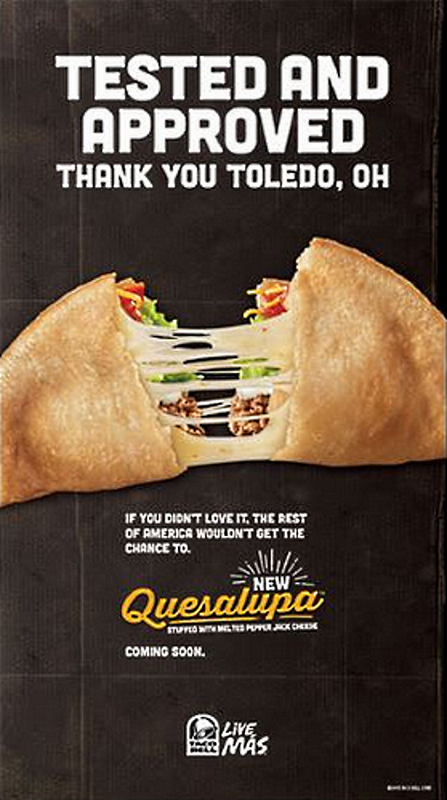 The Toledo, Ohio test market was so amped about Quesalupas, Taco Bell is even talking about a breakfast version. As a perennial Taco Bell test market, the town of Toledo, Ohio regularly bears the weight of a nation’s taco-related hopes on its shoulders. Back in February, the new Quesalupa—a cross between a quesadilla and chalupa—was tested at Toledo-area Taco Bells. Residents of Toledo were hyped about it, and so the Quesalupa is officially launching this year at Taco Bells across America. We had very high expectations for the product and they not only were met but we exceeded all of them. I don’t think there’s ever been so much focus or pressure on a single test we’ve had. Usually on a marketing test you’ll try one or two stores, but this was a big test. And the rest of the nation knew it was being tested in Toledo. The Quesalupa is priced at $2.99 and features beef, lettuce, cheese, sour cream, and diced tomatoes inside a crispy shell that’s (very crucially) stuffed with melted pepper jack cheese. When YouTube reviewer Daym Drops took apart a Quesalupa and tried the shell by itself, he said it tasted like “buttery heaven,” and praised “the spicy flavors of utter perfection” that come from the pepper jack cheese. Prince said this test was a much bigger deal than previous Taco Bell tests, because the company believes the Quesalupa isn’t just a new product by itself—it could potentially be a whole new product category. Taco Bell is already testing and toying with the idea of breakfast quesalupas. While you’re thanking Toledo for bringing the quesalupa into your life, think back about those Doritos Locos tacos. Those also became a legit phenomenon after their Toledo test run. We didn’t know the phrase “Holy Toledo” had anything to do with Taco Bell, but after this, we think it just might.